It wasn’t a night for calling ahead, for calling in favors or waiting in line. It was a night for dropping in lucidly without stress or a reservation. We didn’t go to Tickets. We went to Bodega 1900 across the street. The name of the restaurant celebrates the birthday of the building that houses it and the menu recreates the cuisine of that era with a heavy infusion of Adrià wit. 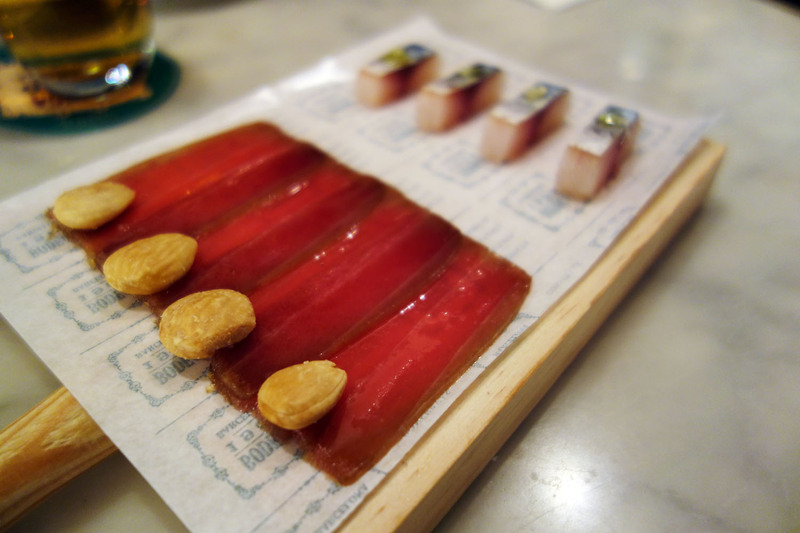 It’s a post-elBulli project of Albert, who is prominently featured in framed black and white photos adorning the walls, with his brother and other kingpins of new Catalan cuisine. The place is an old school watering-hole, a drink-forward snack bar at heart. It’s a vermutería but one that seems to offer only one blend instead of a library of choices. The signature mix of 90% Martini Rosso and 10% Gran Lusso is the lifeblood flowing through the veins of the place and everything pairs with it consistently well. The bones are pickled things, canned things, jarred things, cured things with an air of corner-shops past. They’re presented in ways that are novel and clever; menu titles give away none of the surprise. 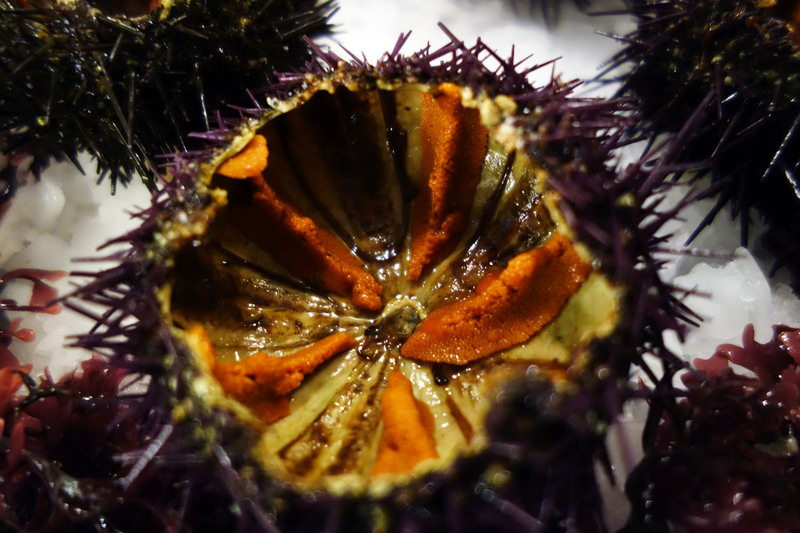 Adrià’s iconic Spherical Olives paved the way to one of the funnest meals I’ve had in a long time. I know the drill going in. There is perhaps no dish in the world more thoroughly reviewed. I know how it’s made. In fact, I’ve seen it made, live. I’ve seen it made by Ferran in Science Center Hall A in front of an audience of Harvard chemistry majors during a Science of Cooking class. I also know what it represents. Pickled things, jarred things, turn-of-the-century vanguardist Catalunya. And I know what to expect. A dense little mass on my tongue, a burst of brine, a melting finish that makes my tongue gasp for more. A slick wooden spoon in the groove of which rests a green thing that looks like a Gordal olive but which is not actually a Gordal olive. Alas, the surprise is long since shot, but the expectations are met and surpassed…just as I expected. A flash of white light blinded my other senses as my tongue and palate took in spicy, salty, vinegar brine of a pickled piparra pepper infused olive juice and then the murky, marine, vinegar brine of an anchovy infusing the same. After the shot of flavor hit hard it faded, and my tongue prodded in a desperate and futile attempt to hold on just a moment longer. After only a few seconds the taste was long gone, leaving behind only a memory of the sensation. And that’s the famous Adrià olive, a fleeting moment of outer-worldly bliss followed by a longing to prolong the same. 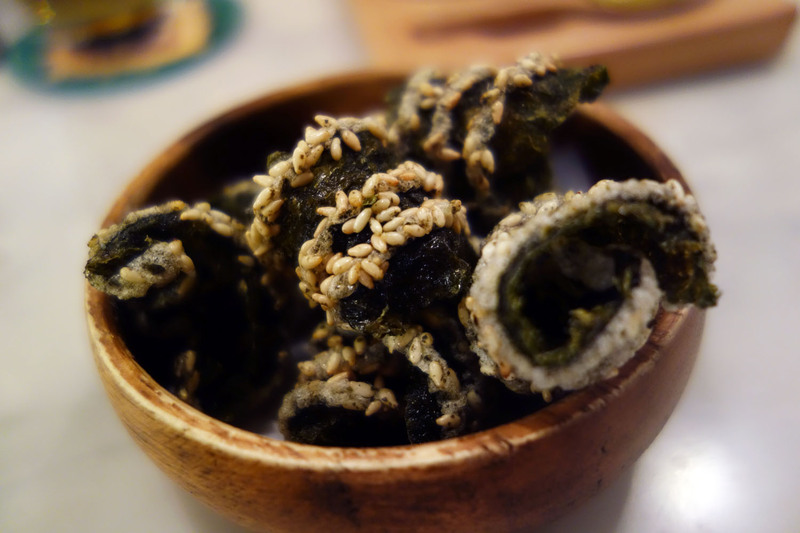 Then some algues cruixents, curly fried chips of seaweed speckled with white sesame seeds. A smarter-than-you crunch and the toasted, nutty flavors of the seeds rounding out the toasted, nutty flavors of dried seaweed. These are airy, porous things curled from the frier that reminded me of the crunch of chicharrones. The tongue sticks to the surface in a very similar way. This snack contrasted perfectly with the silky smooth olives, though the two dishes shared a playful lack of substance, like a lack of willingness to stick around and satisfy longer. Two nimble birds flittering freely, teasing my dumb and greedy tongue into chasing them. Then came something more generous, a board of house-cured moixama tuna and soldiers of smoked mackerel dotted with olive oil and sea salt. 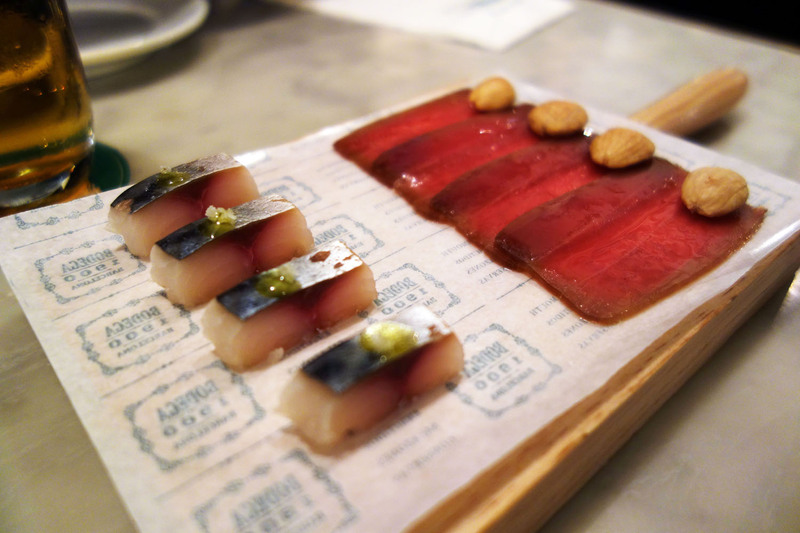 The delicate, slippery slices of tuna were each served with a plump Marcona almond, toasted and crunchy and comforting against the coolness of the fish. The presentation hinted subtly, “Roll me up…Do it,” and that’s just what I did. The mackerel was beautiful as well, with a healthy purple center fading out to a pinkish white exterior, a thin film of silver skin accented by golden oil. It was powerful on the palate, a smoked and salty, oily fish. A gorgeous combination, these two. A happy juxtaposition. Next came a paper-thin slice of Rubia Gallega beef carpaccio, which I peeled with my fingers off its wax paper and lay gingerly on my tongue. It melted readily, the ruby red meat marbled heavily with creamy, supple fat. The beef had been cured for three weeks with spices and, I think, a bit of sugar before being gently sliced and served. I would say this is a dish one can’t not order when visiting Bodega 1900, but then again this applies to all dishes I tried that night. Our flow of house signatures was interrupted just long enough for me to lean back in my chair and savor the oily smoothness of my vermouth while also guaging my level of fullness. As I did so I glimpsed a large metal bowl sitting on the bar behind me, topped with ice and dripping with condensation. 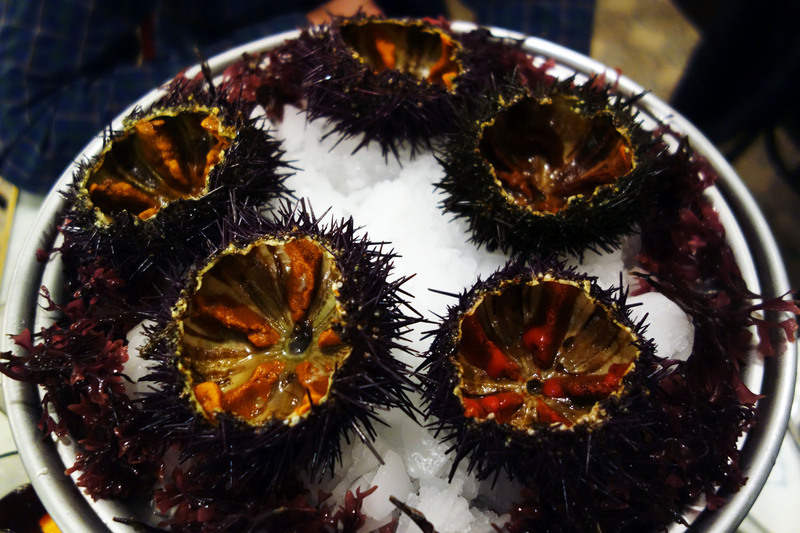 Nestled in the ice were spiky black cups of Galician urchin. The dark orange rows of coral sparkled in the dimly lit room. 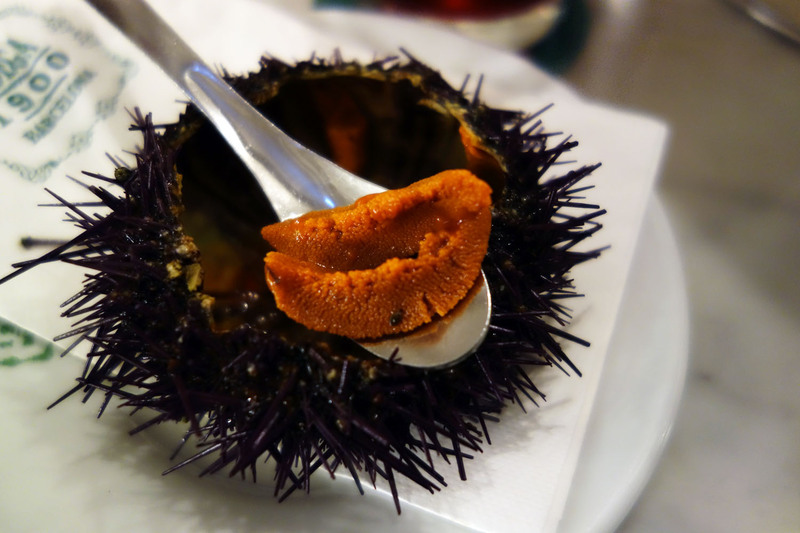 I fumbled for my phone to translate “urchin” into Catalan but ended up pointing instead, as if deaf and dumb. Moments later our own bowlful arrived to the table with another glass of vermouth, perfectly timed. They were dark and murky, as if sweating out the sea with a mellow, rotting sweetness intertwined with brine. They were mushy and soft like a tongue younger than mine and they locked my mouth in the most innocent of kisses. Delicate uni scraped out of a rough shell lent the perfect opportunity to catch my breath between dishes pouring forth from kitchen and deli. Perfectly paired were hearty slices of Coppa Joselito and an 18-month ripened, hard Flemish cheese called Brokkeloud Roeselare. Beautiful, powerful, substantial flavors in both. The salty, fatty coppa had the faintest notes of oak, garlic and pepper paired with the salty, naturally sweet acorn eating ibérico pork collar. An Italian cut but one produced from the best pigs Spain has to offer. 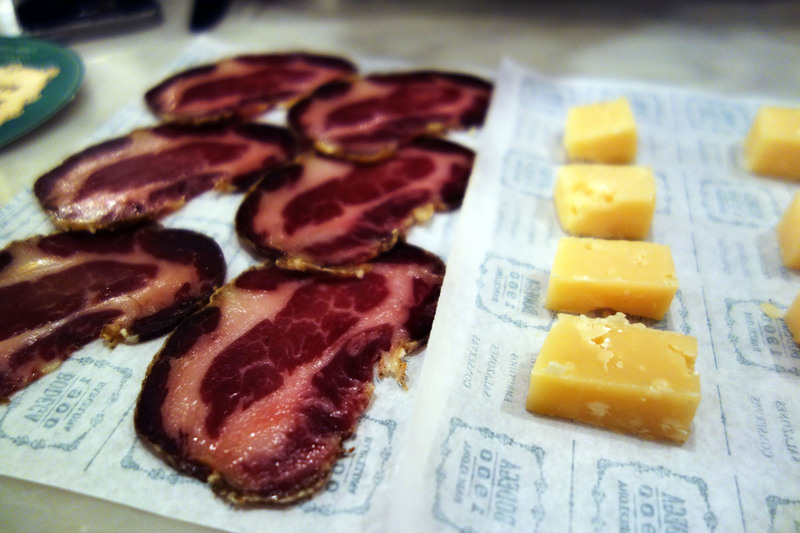 They weren’t sliced too thin, requiring my jaw to move for the first time that night, and as I chewed the cured meat flooded forth more and more flavor. It was a pleasure to try anything from Joselito pork, as these have moved many great chefs to wax poetic. Chefs like Ferran, Arzak, Subijana, Ruscalleda, Joan Roca, Robuchon, Boulud all prefer it, considering it a source of inspiration, a marvel of gastronomy. Next to the meat were little cubes of bright yellow cheese, crumbly with bits of brittle, crunchy salt crystals distributed through the dairy. Salty and pungent, very aged in flavor, this cheese stood up heroically to the bold flavors of the coppa and made for the perfect match. The dishes at 1900 were, for the most part, a nice break from the mountain cuisine I had grown used to and wary of in the Priorat. As we perused the menu initially, I had specified no tortilla and no mushrooms. I had had enough of both. But, sure enough, some ceps did appear before us, hot off the grill and drizzled with green herb oil. They turned out to be delicious though, spongy and soft, a bit chewy here and there. They were chopped into various shapes, bringing about a nice mix of textures. The flavor was of forest floor and of the moist, fertile soil they were plucked from not long ago. Green herbs helped clean up the dirt flavor, adding a much needed freshness to round out the dish. At one point my dinner companion and I look up from our plates just long enough to acknowledge two guests sitting at a table a half-meter from ours. I rolled my eyes, an involuntary reaction to the fact that they’re Americans, overweight Americans with expressions that silently state, “I deserve this. I’m worth it.” They don’t seem to excited by anything. I assume it’s not because they’ve seen it before but because they’re too stupid to recognize the art being lain on a plate out before them. As their waitress rolls back the tin lid of a can, table-side, and removes a very large sardine from its seemingly century-old pool of oil I can barely contain my excitement. I tug at my companion’s sleeves and whisper, “Look! Look! Just like that!” I think of my father and his love for canned fish. But as the sardine glides out and slaps itself onto their plate they show no joy, no amusement by the playful irony of the dish. As I hear them order “the hotdog thing” I make a note to tell our waitress to skip that dish. But it comes to the table anyway. After all, we’re not in control. 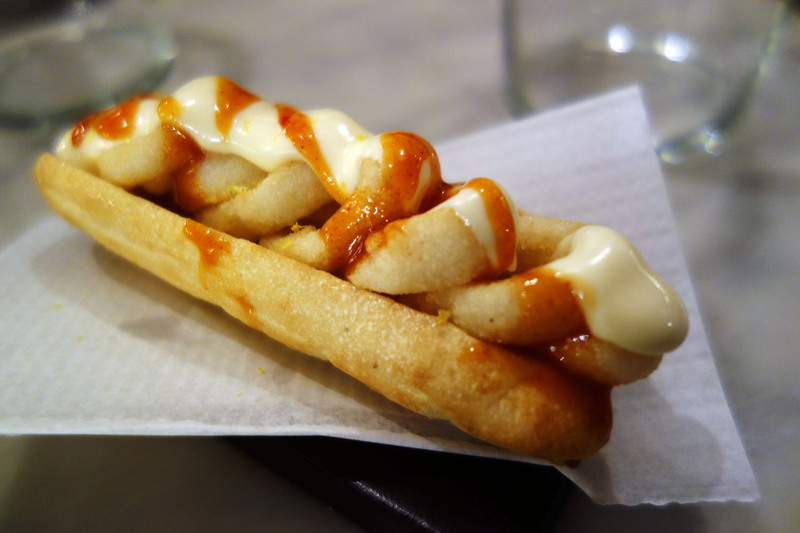 I frown for the first time that night, not too excited by what looks like a flaccid frankfurter bun filled with fried calamari and bravas sauce squirted over. At least it’s only about 2 inches long. But as I grip the sandwich the surface of the bread stays firm and there are none of the fingertip-shaped imprints I had expected. It’s a doughy and dense mollete roll, the same stuff those wonderful €1.4 bocadillos de jamón that I have had virtually every morning for breakfast are made with. The original mollete of Andalusia is round, usually toasted with oil and rubbed with garlic. This one was toasted very lightly or maybe even just warmed up a tad. It was slightly crunchy but maintained a moist and chewy, bagel-type consistency on the interior. Assembled carefully in the slit of the roll were small rings of squid coated with the crispiest of breadcrumb coats that was fried to a light shade of brown. A fluffy and light home-whipped aioli was squeezed over the top, interwoven with a spicy red sauce made with kimchi, soy sauce and chipotle chile. Each bite was a pure joy. The tight toasted skin of the bread, the chewy and cooked interior, the sandy breadcrumb crust and delicate squid flesh inside. Then the creamy aioli, mixing with the hot oil from the calamari, flooded my mouth with its garlic comfort, all the while the piquant red sauce stung my tongue slightly. A brilliant composition of flavors and textures that leave me staring at my dining companion in disbelief. He appears to share the sentiment. A powerful surprise. And that’s Bodega 1900. Magic tricks, clever ones. Bright, simple dishes with five ingredients or less. There’s a sense of childish astonishment and a bashful, honest joy inspired by the textures and flavors presented. Lots of things are unapologetically fatty, crunchy, creamy, sweet. And while some dishes come in disguise, most are pleasantly blunt in revealing their identity. December 4, 2014 in BARCELONA.